Virtual Reality (VR), 360 video, and Augmented Reality (AR) are the hottest technologies experts are talking about for live events. 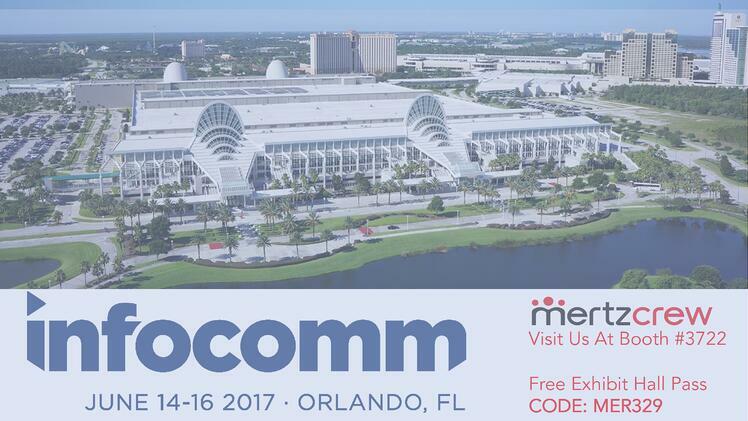 Infocomm has dedicated a section of the show floor for specializing exhibitors to showcase various ways of how this technology could be used to create a unique event experience. Click HERE to see the location on the show floor. 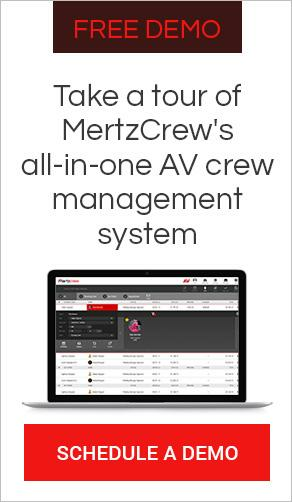 Whether its dealing with new compliance laws related to freelancers, the ever growing challenge of finding quality freelancers, or you're just looking for a better way to manage all crew scheduling and time tracking, Mertzcrew can support you in a number of ways. We will showcase our latest features including Availability tracking, Labor Cost Tracking, and Enhanced Search of 5,000+ freelancer profiles all across the U.S.
Short on time? Stop by our booth for a brief 5-minute review & highlight demo. Or you can sign up here to request a more in depth demo at the show. You can find us at Booth #3722. Center Stage will take place on the show flow and will feature 20-minute presentations from leading technology practitioners in the fields of entertainment, enterprise, healthcare, and hospitality. During these talks, speakers will demonstrate how environmental design and technology integration can be optimized to achieve better experience outcomes. Best of all it’s FREE! Orlando is way too hot in June to eat outside so Infocomm is bringing “The Park” indoors. With live music, games & activities and a variety of food trucks, The Park will be a popular place to rest your feet and get a good meal. Happy hours are on Wednesday and Thursday 4-5pm and Friday 3-4pm. Rumor has it there will be FREE BEER!! In business, every meeting is essentially an organization telling the audience a story in the hopes of reaching a specific objective. This new and innovative conference brings some of the best in storytelling from Pixar, MIG, Amazon, Jack Morton, TAIT, and more to share the ways new technology can be critical in enhancing the impact of the story to make people feel, think, and take action. The TIDE conference will be held Tuesday June 13th at the Hyatt Regency Orlando and the cost is $799. For more details and to see the full list of speakers click HERE. There are hundreds of great courses from Infocomm. Below are three of my favorite must attend courses for live event professionals. Having great project management is critical to any organization to be able to maintain its existing client base and grow in a profitable manner. This course will benefit those looking to grow into this role or maximize their abilities in this role. Projection mapping is still one of the hottest technologies due to content creators and technology providers endless abilities to make this experience unique to so many environments. 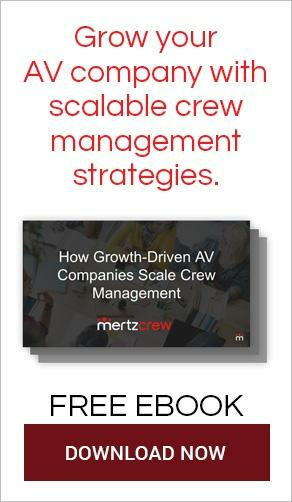 In this session you will learn how to apply this technology to events of any size. Looking to meet or expand knowledge amongst industry peers or find out the latest happenings in the live event community then the Live Event Forum is something you don’t want to miss. This year’s session you’ll hear first hand from a panel of meeting planners what’s going on in their industry and how live event production providers play a role in supporting their needs. Post event will be a networking reception next door where you will get to network, eat and drink with your peers. The Forum will take place Wednesday June 13th from 3pm-4:30pm and the reception will be immediately following.